Work in Progress - "Follow The Leader"
I started working on a full sheet painting of carpet roses that grow beside our pond. Beautiful pink, reds and wine shades. Then I had an overwhelming urge just to play. I set aside the painstaking drawing of roses and found a half sheet of Arches 300lb paper just waiting for inspiration. Hmmm – whatever can I do? When ever I get in this frame of mind, I generally go directly to all my pet fish photos. I played with the composition, this one here – that one there and so on. Landed on a composition that I liked and loosely drew it out. Then I got out my little metal cups for mixing large amounts of color – masking compound (again –boy am I a glutton for punishment – this stuff is challenging at best) and started pouring paint. 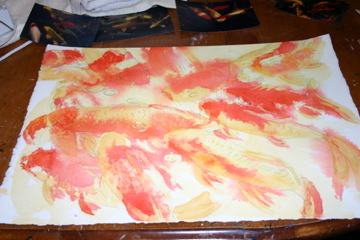 This process is quite interesting – reminds me of batik with out the wax. Pour pale yellow – let it dry, apply mask. 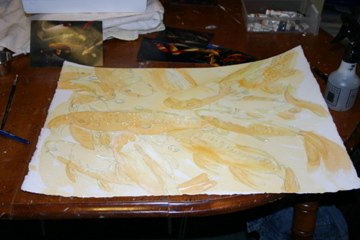 Pour darker yellow, let it dry and apply more mask. Over and over and over. Now, removing the mask is like a work out. Need to use a gum eraser and rub and rub and hope for the best. Once I had all the mask removed , I went in and painted the detail work. 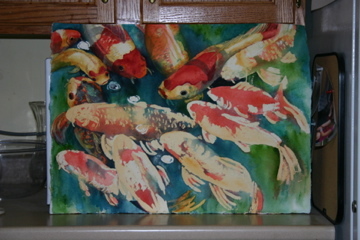 This is by far the quickest I have ever completed a painting of this size. And you know – I really like it! And soon - the reveal of the finished painting!